Etrian Odyssey Untold: The Millennium Girl is two massive roleplaying games in one package, and you'll be able to get your hands on it this October. Etrian Odyssey Untold: The Millennium Girl has earned that lengthy title by including both a remake of the original Etrian Odyssey and a host of new content. It's described as a "a game in two parts," the first of which is the remake while the second is new content, effectively creating an entirely new starting point for the franchise. 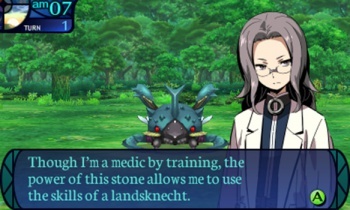 Those of you who have played any of the Etrian Odyssey games should know how much game content this will include, but what we haven't known is when and how we'll be able to purchase Etrian Odyssey Untold: The Millennium Girl - until now, that is. This morning publisher Atlus dropped full release details for Etrian Odyssey Untold: The Millennium Girl. According to the announcement, the game will debut on October 1, 2013 and will feature a retail price tag of $40. That's pretty standard for a Nintendo 3DS title, but with this being an Atlus release we'd expect some manner of pre-order bonuses or some kind of extra pack-in item with the game itself. I've got five or six different soundtrack CDs lying around my apartment courtesy Atlus, and while we expect the company to continue its generosity with Etrian Odyssey Untold: The Millennium Girl, the company has yet to reveal any information on that front. We'll bring you more when/if Atlus opts to unveil the game's bonus extras. Until then, stay tuned.